This is a road trip that that began with a night of camping, and a morning with elephant seals. Now we pick up where we left off... with Love & Rockets enjoying breathtaking views and Big Sur flavor, at Nepenthe. It was Alex's idea to treat ourselves to the scenic drive along Coast Highway 1, finishing with a Maker-Prom worthy meal. It was a happy choice... even waiting for our table was mellowing and good. I love this wall of benches, the cushions, the view. It's not hard to imagine the legendary parties out on the patio, with a bon fire aglow in the Big Sur mist. Do you know about the family that started Nepenthe? There are small bits and pieces of the story at their website, and even more to absorb in the book by Bill and Lolly Fassett's granddaughter, Romney Steel, My Nepenthe. I enjoyed reading the stories about a place familiar to me, a region dear to me. Some places have a vibe, right, Eli? You get a warm welcome, a comfortable setting, the fresh air, and whatever other elements are at play that spark smiles and creativity. It is a genuinely restful stop. Max senses it, too, I think. There was hardly any wait, or trouble, seating the eleven of us. Some of us remembered enjoying this same table, almost two years ago. It's only fair to caution you: if you go, bring your whole piggy bank. The prices might feel a bit brutal if you are on a prom budget and super hungry. Maybe don't arrive feeling ravenous, because it's a shame to skip it all together on account of price. Going there is about more than just the meal, which will be tasty. There is the whole vibe I was talking about... it feels good there. Good feelings can be very filling. And honestly, my only real complaint about the place is that they stopped serving their sweet potato-pecan fritters and curry dip. I am not quite over this loss. I recall good memories, other road trips, children growing. This is a good life. What will they recall, years from now? What memories will make them reflect wistfully, smile? Geoff recalled a bit of play, some kinetic art he made for me, so he ordered me a Duvel. Good, Belgian beer. And he got to work with the cork and wire that wrapped around it. It's there, on top of the ketchup bottle, spinning, balancing. Here it is, again, now balanced on Eli's knife. Physics and art. A toy. The play we make. We played a lot. Laughed, too. The waitress said, "Oh. That's a new one." And we said, No, we've done this before, to ourselves, happily recalling our make and play. "It's fun to have fun, but you have to know how!" I remember when I wished we could stop here. Now we have, so I have a new wish... I wish we could stay, into the night, maybe all night. It should be open ended... that would be great. A last balancing act before we continue north, to Maker Faire, and more play. 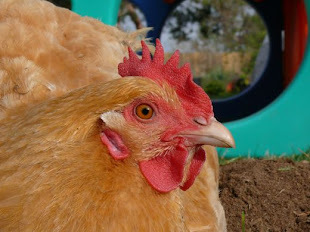 And, one last note: Happy Chickenbloggiversary! Ten years ago, this very day, I wrote about wishes, daydreams, and some chickens we'd just brought home. Thank you for sharing the journey, for comments, gifts, encouragement, visits... what a very, very good life we enjoy. 10 years! That's amazing Natalie. I can imagine all the fun you guys have had in that time; your family certainly knows how. I've had trouble keeping up with you lately, but I'm very glad to see Sir Robin is along for this big adventure. Buen camino! Happy Blogaversary from me, too! Thanks for sharing all your adventures with us! Happy Chickenbloggiversary to the best chicken blog and all-around awesome everything blog in the land! You've had a great 10 years, trials, joys and all...and just think what wonders the next 10 will bring. I'm so glad you are here sharing with the rest of us because everyone has a special story and they all matter very much to us and to the world. I love your panache and your family and your friends too. You are all amazing and beautiful in so many ways. Nepenthe is a great place to eat. When the zombies come, let's live there! It will be great. Love, Maria. Maria, I could live here, with you, any time!